With energy efficient lighting on the rise, people are beginning to turn to LED bulbs for their lighting needs. However, some of you may have a disregard for these bulbs due to various reasons. So, before you return your “defective” light bulbs, here are a few things you should know about them. LEDs are directional. Because they consist of flat chips, the light of LED bulbs generally faces one way. Some brands will focus the light outward or create with a lens that bends the light, making their LEDs omnidirectional. There is a difference between R bulbs and PAR bulbs. R (reflector) bulbs contain a diffuser, eliminating glare and softening the edges of the light. This makes these bulbs great for indoor use. PAR (parabolic aluminized reflector) bulbs do not have a diffuser. Instead, they are open and contain an aluminum reflector in the shape of a parabola. This allows the light to shine further and create a spotlight effect, making them perfect for outdoor use. The LED wattage equivalent to an incandescent isn't important. When you see the wattage of your LED bulb equates to a particular incandescent, that number only matters when you are trying to compare energy savings. The important number to look for is the lumen output. Lumens determine the brightness of your bulb, so you want to be sure to verify that the lumen output of your new LED bulb is the same as, or close to, the lumen output of your old incandescent. True 100W equal LED A19s do not exist… yet. They don't. I know what you are thinking. "I just saw a category for LED A19s on your site." Yes, that is true; however, a standard A19 features a lumen output of 1600 lumens. LED bulbs create too much heat to allow for 1600 lumens. "But I thought LEDs don't get hot," you say. They do; however, they contain cooling components such as heat sinks, fans, or cooling liquids to dissipate the heat, moving it away from the light source and making the bulbs cooler than other standard bulbs. Philips has produced a 100W equal A21; however, the size can cause issues when used in task lighting as it can be too big for a lamp’s harp. If your LED bulb fails before expected, it could be due to component malfunction, not the LED chip. Did your bulb die before the average rated life listed on the packaging? Before you claim the bulb to be damaged, consider the fact that there are many components to an LED bulb. If one of them goes out, the chip won’t run. Another thing to consider is that the average rated life is an average amount of hours. When the bulbs were tested, 50% stayed lit through that amount of time; some went out before, and some went out after. There is such a thing as too warm. Be sure to check the color temperature of your LED bulb. If you end up with an LED that is 2400K or under, the light output will have a pink hue. However, if you like the color pink; LED bulbs with a low color temperature could work just fine. Your LEDs are not faulty. Your timers and dimmers aren't, either. For night time lighting, many people use timers to turn their decorative LED lights on at a certain time every night and off in the morning. Some people like to create ambiance, so they use dimmers to tone down the lighting. So, what's with the flickering and glowing? Decorative LEDs operate at a low voltage, so much so, that there is an extra amount of current that continues to leak through. The extra voltage is what keeps the lights on even after you have turned them off. To stop this voltage leak through, add a 120-volt incandescent bulb. The bulb will absorb the extra current, allowing your lights to turn off completely. You can still buy 100-watt incandescent bulbs. For those of you who cannot part ways with your 100-watt incandescent bulbs, do not fear! While they were "legislated out" of existence, the makers of your favorite bulbs have found a way around the legislation, allowing them to continue making the 100-watt bulbs. They have started making them with an additional filament support; which, in turn, classifies them as "rough service," making them exempt from the legislation. 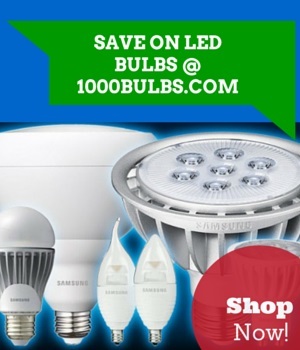 Still having trouble with LED bulbs? Don’t hesitate to reach out to us in the comments or let us know on Facebook, Twitter, or Google Plus?